Franke has introduced Box Center, a premium stainless steel sink for large open-plan or compact kitchens, where workspace is at a premium. It features seven food preparation accessories for cutting, rinsing, staining and draining, which have all been designed to be within easy reach. 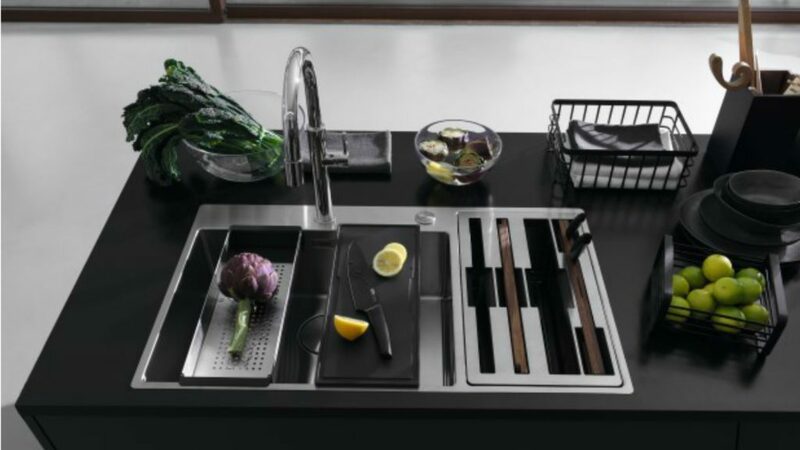 All accessories are included in the sink purchase price and include a set of chef quality knives, knife holder, stainless steel strainer bowl, food preparation platter and chopping board. In addition, it boasts a wine rack which doubles up as a drainer. Styled as a Slim-Top inset model, Box Center features Franke‘s push-button, pop-up waste which automatically drains the water without the need to reach into the bowl. Franke recently launched made-to-measure stainless steel worktops for the upper mid to luxury kitchen sector.